>Just before I left Jackson to return to Memphis today, I drove through the parking lot at Maywood Mart Shopping Center, to get a latte at Starbucks for the drive. Creeping slowly past Le Nails (more on that in another post!) and the liquor store and grocery store where Mom used to shop, I stop and watch two older ladies slowly unloading their groceries into their cars. They look to be about Mom’s age (80) and well-kept, their grey hair obviously maintained weekly at the beauty parlor. One of them looks familiar… could easily be someone from Mom’s church, luncheon club, or an old neighbor. What struck me was this—what’s the difference in them and Mom? How is it they are still living independent lives, out in their cars on this beautiful, colorful November day, free to select the food they will go home and prepare in their kitchens, for themselves, and perhaps even their husbands? The contrast is stark. Leaving the nursing home where Mom is in rehab for a broken hip, I could barely walk through the halls without running into dozens of elderly folks blocking the crowded space around the nurses’ station. Many of them are “trapped” in their wheelchairs with trays that prevent them from falling out. Some of them smile or return my greeting as I pass by, but others stare into space or don’t even lift their heads from their trays. 99% of them are black, which isn’t an issue for me, just a demographic that plays into the scenario for Mom. Mom doesn’t like to leave her room. There’s a waiting list for this facility, and I won’t know for a few more weeks whether or not Mom will improve enough, mentally, to return to Ridgeland Pointe. She can stay where she is indefinitely, but I keep asking myself if I would want to be there, and how much the place itself is responsible for her unhappiness. Yes, she’s very unhappy now. But her Alzheimer’s has been exacerbated by everything she’s been through this past month—especially the anesthesia for surgery, a week in the hospital, and now three weeks in another unfamiliar facility. And she really hates having sitters with her all the time, telling them “I don’t need you, you can leave now” quite often. But without them, the nursing home would probably have to put Mom in restraints, because she can’t remember not to get up and try to walk on her broken hip. Throughout this time she complained that her hip hurt and asked why her chair was different from mine, which she was sure was more comfortable. Imagine this conversation times ten, at least. Finally we’re back in the exam room, waiting for another 15-20 minutes and Mom begins to say she has to use the bathroom. So I go out in the hall and tell the nurse that Mom is in a diaper, but we’re hoping she’ll be getting weight-bearing status today so she can use the toilet, and she’s been constipated and she really really needs to go, so can someone help her to the toilet? The nurse says she’ll call someone, a “cast technician” so we wait. The only cast technician around is a male, and he’s not allowed to help her to the toilet, so the nurse says to tell Mom to use her diaper and they’ll give her a dry one. Mom says she’ll just wait. Finally they take her across the hall to x-ray and I hear her cry out with pain getting on and off the table. When she returns, we wait again. This slowed her down a bit, and I explained how frustrated Mom was (and constipated) being in a diaper for a month now, and could she now use a walker and a toilet? The nurse practitioner said she could if someone helped her, or if she understand she can’t put any weight on her right foot yet. I said we’ve got sitters 24/7 for that purpose, and she said great, tell them Mom can do that. And I said please write this down for me to take to the nursing home, because the nurses and aids aren’t allowed to do anything without the physical therapists’ orders and she said she would. After they removed the staples, we waited (again) for the nurse to return with instructions, and again Mom asked to use the bathroom. I looked up and down the hall and counted 5-7 people in uniforms, some standing around, others going in and out of rooms. Then I returned to the exam room and told Mom we were leaving soon, could she wait? And she said she could. We waited another 10 minutes, so finally I took Mom (in her wheelchair) out to the front door where the shuttle from the nursing home was picking her up, telling the nurse that I would return for the paperwork. After putting Mom on the shuttle, I found the nurse who handed me the instructions to take back to the nursing home. I read over them to be sure they were explicit, and yes, they included the request for a bed-side toilet and a walker, and for the PTs to begin gait training activities, etc. But at the bottom of the sheet there were three questions, and when I read them and the boxes they had checked (yes or no) I just shook my head and took the sheet back inside to the nurse. The nurse nodded and offered to change it. The nurse nodded again and took the form back to the computer and returned with a corrected sheet in a few minutes. I left and drove to the nursing home, where Mom was already upstairs in her room picking at her late dinner while her sitter, who accompanied her in the van, was finishing her own hamburger. Mom asked the sitter to leave, and then told me (again) how unhappy she is having someone in the room with her all the time. She thinks they are “going through her stuff” when they’re just helping her. (Yes, I’ve checked, and nothing is missing.) “I’m just really unhappy,” Mom finally says. This is the most clarity she’s shown about her emotions. “No, Mom, this is your room in the nursing home where you’re staying until your hip gets well and you can walk again.” I get back out the pictures of her apartment and ask the sitter to look at them with Mom again while I’m gone. I went downstairs and met with the director of social services, and told them about the staples that weren’t removed and the orders for a walker and a bedside toilet, and she said it would be Monday before they could get the walker and toilet, which means she has to wait three more days. I consider going to a medical supply house and just buying them myself, but I realize that they probably can’t get the “orders” to the nurses and aids to allow this change before Monday anyway, so I’ll wait and let Medicare pay for them. 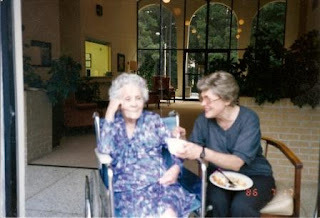 So I’m a bit of a basket case, trying to learn not to let my mother’s physical, emotional or mental state control mine. 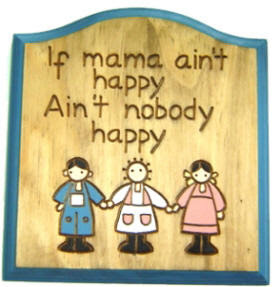 (If Mama ain’t happy….) And trying to remember to be thankful for the good times, like Thursday afternoon, when Mother’s old neighbors, Donna, Sis and Ed, visited her at the nursing home. Donna Burt and Sis and Ed Kemp lived across the street from my parents for about fifteen years. When my father was dying with cancer, Ed used to drive him to the men’s prayer breakfasts at the church, and later just came to sit with him so Mom could run errands. He’s about 85 now. This is Sis, Donna and Ed visiting with Mom. At first I’m sure she didn’t know them, but after a while she seemed to. Or at least she seemed happy.